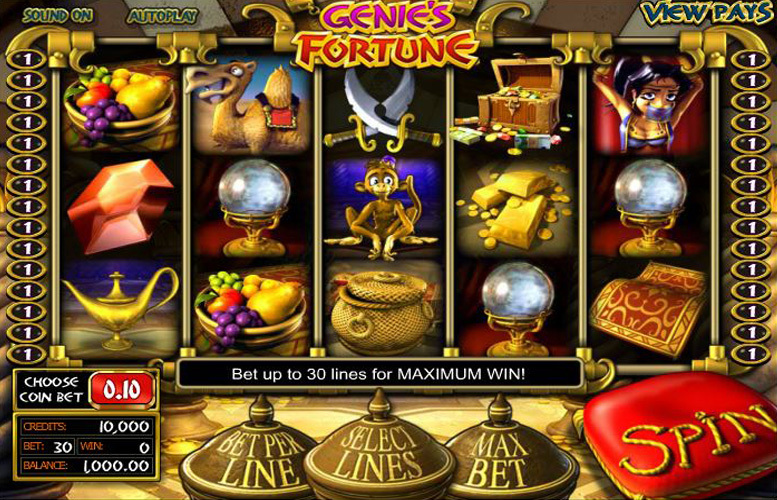 The Genie’s Fortune slot machine from BetSoft is another Aladdin/Arabian nights-themed game. It features solid artwork, great music, and enjoyable side games. These positives come together to create a great title amongst many duller offerings using a similar theme. The game itself is played across a five by three board, and there are thirty win lines which can be activated at any one time. There are some nice animated touches throughout, especially when wins are dropped, however, the moving characters hardly compare to some of the lavish visuals of other BetSoft Games. Many great features. The Genie’s Fortune game has a plethora of side games that keep the replay value high. Good art style and music. These help to create a suitably mysterious feel for a quest for riches in the desert. Low upper betting limit. We’re eagerly awaiting a game from BetSoft with more than a £150 upper betting limit. Unfortunately, Genie’s Fortune isn’t it. Very low main game jackpots. With the top prize being just 250x the line bet, the big money is won during the side games which fortunately, there are a lot of. Magic carpet = 250x the line bet. Woman = 200x the line bet. Camel = 160x the line bet. Gold = 120x the line bet. Sabres = 100x the line bet. *Payouts are for one bet per line – five are possible increasing the top prize. Players who land a carpet symbol on any position on reel one will be awarded the Magic Carpet Feature. When triggered, the carpet will fly to the right side of the gameboard from its original position. This squashes all the icons in its way and turns them magically into bonus credits. Land a “monkey” symbol on the second row of reel three to make the monkey go “click me” crazy. 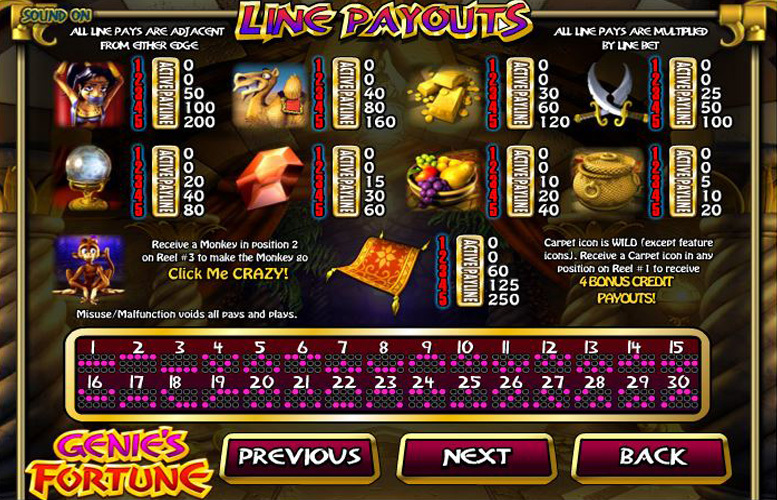 Players will be prompted to click an icon on the top, bottom, or both sides of the money. Once an icon is chosen, the monkey will jump up and shake off the icon on the reels to reveal an instant cash prize. Players can continue to choose “click me” icons until a “collect” is uncovered. 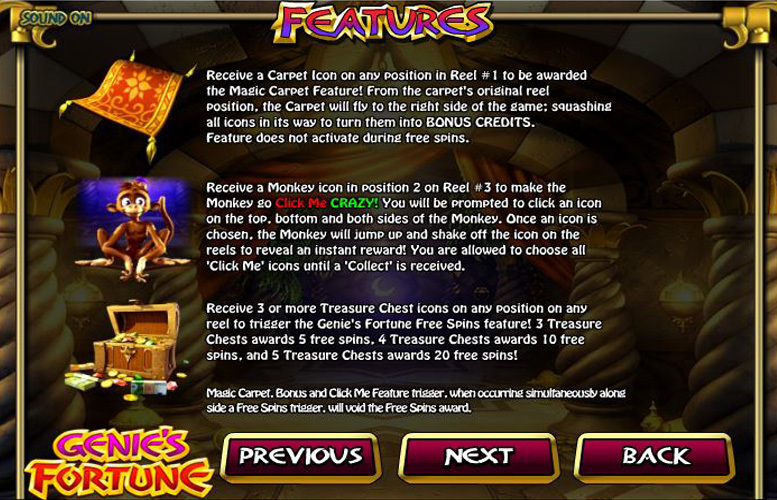 Landing three or more treasure chest icons in any position on any reel will trigger the Genie’s Fortune Free Spins feature. Three, four and five treasure chests will earn five, 10, and 20 free spins respectively. Landing three or more lamp icons on an active pay line will trigger the Genie’s Fortune second screen Bonus Round. Once triggered players will be prompted to click the lamp to release the genie from his slumber. When summoned, he will appear in a puff of purple smoke and offer six wishes from which the player must choose. The options for wishes are: wealth, fame, everlasting love, travel, wisdom, and long life. Once selected, the chosen wish will shower the player in treasures. Crystal ball = 80x the line bet. Gem stone = 60x the line bet. Fruit = 40x the line bet. Snake charmer’s basket = 20x the line bet. Players can adjust all aspects of their bet distribution on Genie’s Fortune. Firstly, they can alter the number of lines played between one and thirty. They can also adjust the value of each coin waged on any spin. Here, the maximum is £1 and the minimum just 2p. Finally, there’s the option to increase the number of coins bet per line too. The range here is between one and five. Therefore, with all values set to the minimum, the lowest possible bet per spin is just 2p, and the highest is a rather underwhelming £150. Unfortunately, Genie’s Fortune suffers from the same flaw as many of the games from BetSoft in that it doesn’t cater well for high rollers. Genie’s Fortune is a great virtual slot by anybody’s standard. It features loads of additional bonus games, and has a fun art style and solid presentation. With a total of four completely interactive extra features, it’s certainly up there with BetSoft’s most bonus-packed offerings. That said, it does suffer from a few drawbacks which afflict many of the company’s titles. The low main game prizes, and the pitifully small upper betting limit will certainly restrict some players’ enjoyment of Genie’s Fortune. This game has a rating of 4 / 5 with 413 total reviews by the users.